It's Facebook Fridays! for December 29, 2017, and we want you to have a wonderful New Year, free from on-the-job, at-school, and online interference. The Lucky Mojo Curio Company is holding a random drawing to give away 8 potent Stop Gossip spiritual supply prizes to quiet loose trash talk. 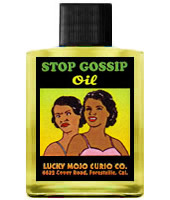 This week, each winner will receive a bottle of hand-made Lucky Mojo brand Stop Gossip Dressing Oil. Wear this spiritual oil on you person, dress your work space with it, oil the soles of your shoes, or anoint a candle -- and as you do so, pray Psalms 37 ("Fret not thyself with evil-doers...") and let the jealous haters bubble away land be consumed, while you continue to do the work you love, with the friends you know, in the place your feet have been planted. First thing tomorrow morning, we will select EIGHT winners at random, announce their names here, and ask them to message this Facebook Page with their mailing addresses, so we can send them their FREE Stop Gossip products. Thanks, Ernie. I shared this to my Facebook timeline. We have a winner! In fact, we have 8 lucky winners! Our Facebook Fridays! winners for December 29, 2017 are: Jennifer Berry Adams, Casildra Wallace, Hugh Hackett, Kristin Murray, Holly T Benton, Amy Rankin, Felicia Rosa, and Goldie Ropes.